Get ready for a new kind of FSO launcher! Never heard of FSO, the SCP or mod.ini files? Download Knossos and you'll be playing new mods within minutes! Just don't forget to tell us if Knossos helped you or if you had problems. You've used wxLauncher for years, can write a mod.ini file in your sleep or have been using 5.5g since it was new? 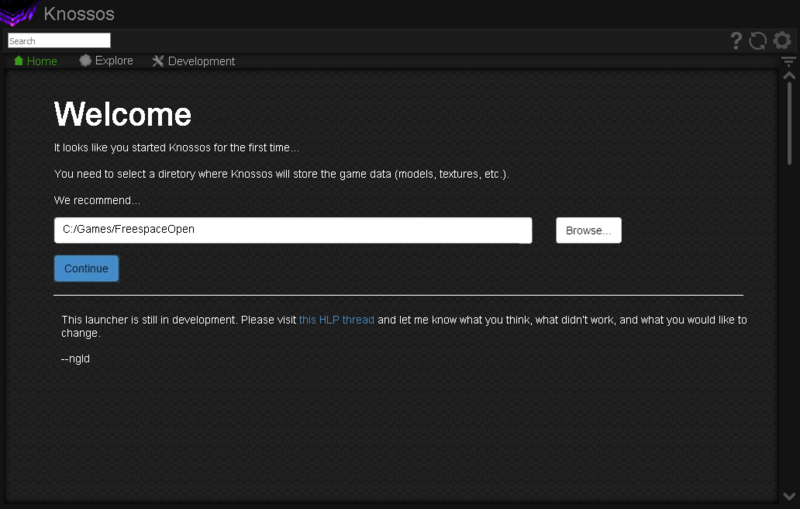 Forget everything you know about launchers and embrace Knossos' new approach! It might be scary at first but trust me, change can be good. 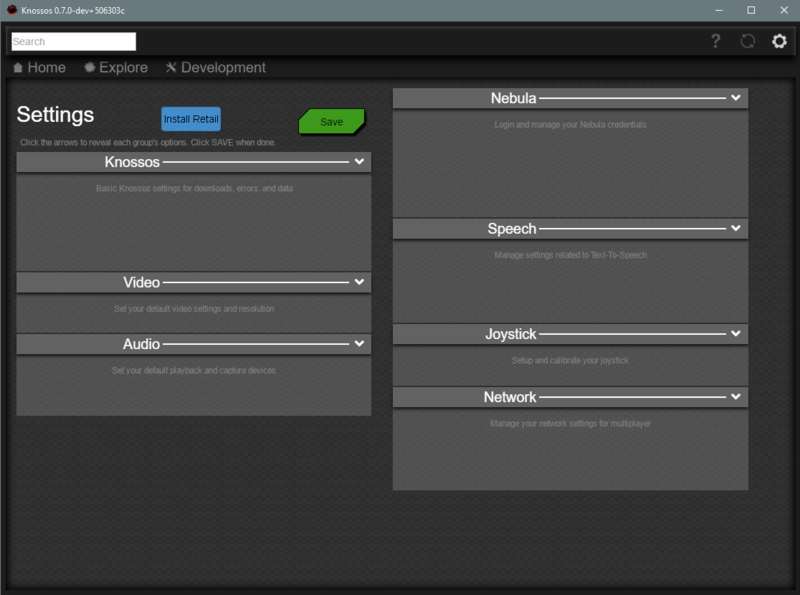 Knossos should be pretty self-explanatory if you use the dev tab to add mods and read the integrated help texts. Just know that we're here to help if you run into issues, get confused by all of the new stuff or get frustrated. Don't use your existing FS2 installation as Knossos' data directory (where mods will be installed) since Knossos uses a new directory structure and isn't compatible with existing installations. It also doesn't support mod.ini files. VERY IMPORTANT: Due to changes in FSO 3.8.0, Knossos will store the engine settings in a new location (%appdata%\HardLightProductions\FreeSpaceOpen on Windows). As a result, once you've used Knossos, all legacy launchers (like 5.5g and YAL) will be unable to start 3.8.0 properly until you delete the new settings folder. This issue is fixed in recent nightlies. If you want to use Knossos together with legacy launchers, use them! IMPORTANT NOTE: Since this is a beta, all errors will be automatically reported to me. If you don't want this, go to settings and turn off the automated error reports. In case you're wondering, the only personal information that can be sent here is your username since it often ends up in paths (like C:\Users\someone\AppData\Knossos\...) and your computer name. Another note: If you upload mods, please don't change your mod dependencies between minor versions (i.e. between 0.3.6 and 0.3.7) to avoid dependency conflicts. Whenever you change your dependencies, please increase either of the first two version numbers (according to the previous example, you'd end up with either 0.4.0 or 1.0.0). Huge thanks to mjn.mixael for the excellent UI work without him Knossos probably would still look like this. If you're interested in contributing or want to take a look at the source code, the code is hosted on GitHub. Bugs can be reported here, there or in the #knossos channel on HLP's Discord. 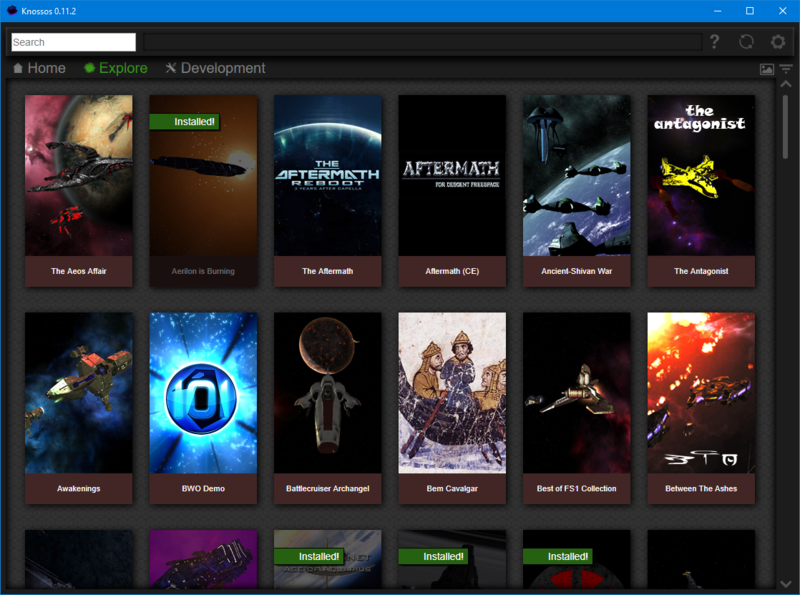 You can create and upload your own mods. You can install the available mods. Knossos will only install FSO builds which you can actually run! Knossos resolves dependencies. If a mod needs the MediaVPs and you don't have them yet, it will install them for you. It can launch mods and FRED. 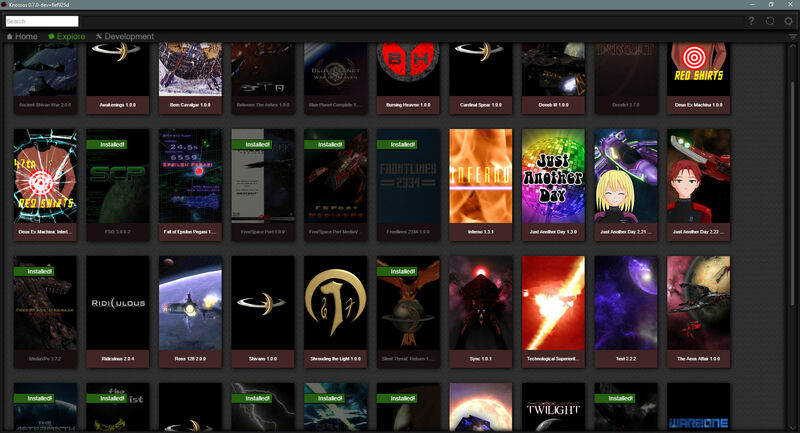 Staff list: Give other users access to your mod to edit it and upload new releases. FSO is listed together with other mods. The network section of the settings screen isn't implemented. The sorting menu doesn't work. Ubuntu users running any version before 17.04 are stuck on an old version because those Ubuntu versions are missing the python-pyqt5.qtwebengine dependency. Tags: Modders will be able to assign tags to their mods which can then be used to filter the mod list. This biggest change here is just adding the default install location. Most people shouldn't have to worry about this. Turns out this doesn't need an autodetect button. Instead Knossos does that automatically and we just let the user know if we detected FS2 here instead of all these BUTTONS. If you point it towards a way to get Retail, let's give some sort of visual feedback that something is happening, even if it's super fast copying of files. Or the user can skip this step. Explore should link to the Explore tab, MediaVPs should link to the MediaVPs Details page. 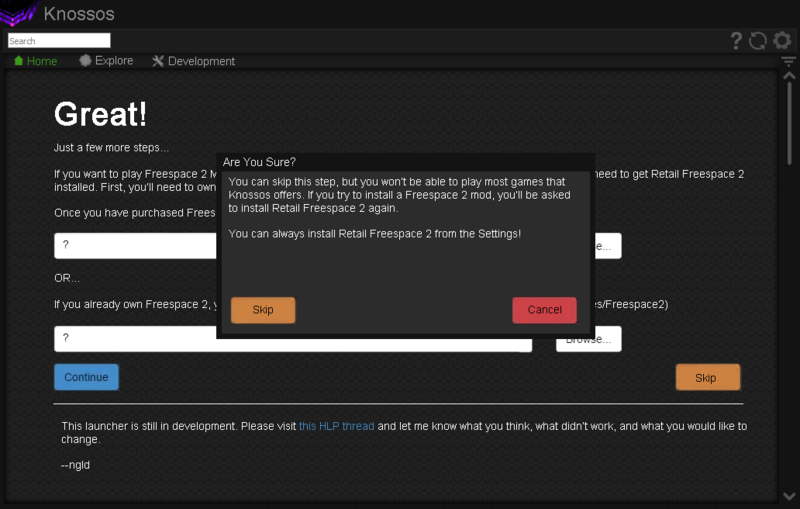 If the user has not installed Retail Freespace 2, let's add a button in Settings that just takes them right back to Page 2 of the Getting Started wizard. It should go on from there including Page 3 to suggest the MediaVPs. 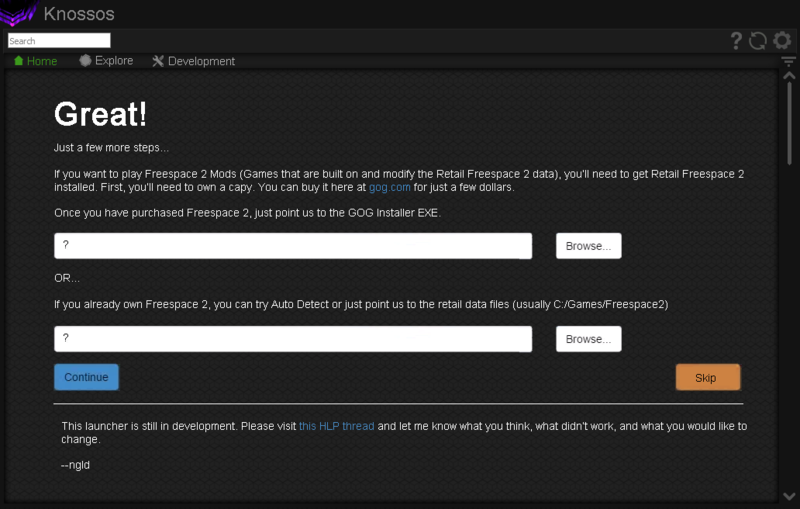 The other thing I would add (and this would relate to the Last Played data that we don't currently track) is a prompt on the first run of Retail FS2 that says "Looks like you want to play the original Freespace 2 game. We just wanted to let you know that this is exactly the game that was released in 1999. 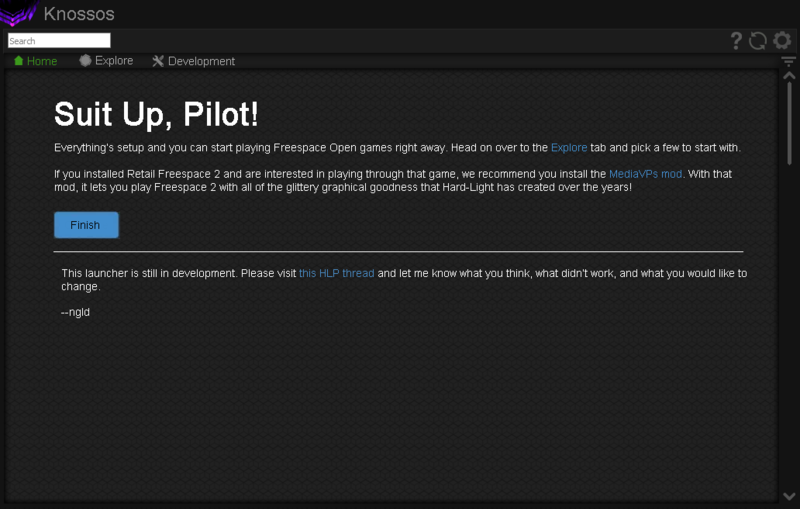 If you want to play graphically updated version, you should install the MediaVPs"
Feedback? Does this cover all the potential hiccups for new players? Could the mod version numbers be removed from the Home and Explore tabs? It looks weird to see a version number that often has no real meaning since for all mods except maybe the MediaVPs only the latest version matters. Does the mod.json format and Nebula support changing the mod title for every version? That could be used in this list instead if the version is relevant for the mod (e.g. 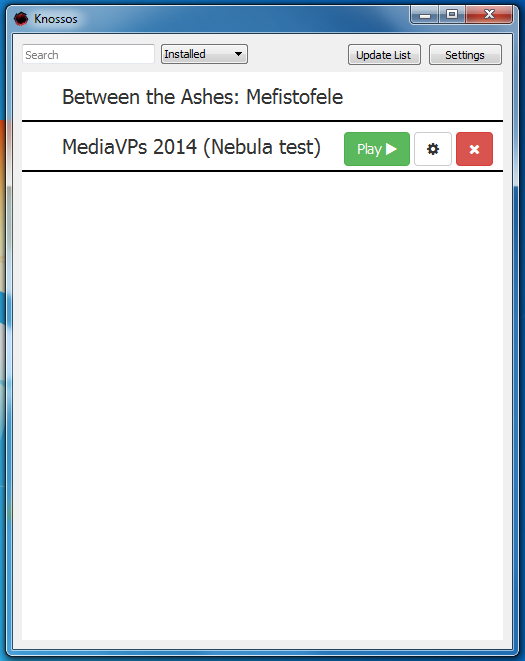 MediaVPs 3.7.2 would be displayed as MediaVPs 2014). Everything looks so cool and professional, hats off to ngld and mjn for their tireless work so far! A second hat off to mjn for all that cool art made/remade for the campaigns, and a third hat off to PIe for uploading a good number of campaigns too. You guys are awesome. TCs are implemented but haven't been tested. Feel free to report any related bugs! Okay, Diaspora is now available for people to test whether TCs install correctly. Quite frankly I'm rather surprised we beat Wings of Dawn to be the first TC on Knossos. I had no issues installing and loading up Diaspora. I plan on putting WoD on Knossos good and proper when I release episode 2, episode 1 is too old and busted right now. Totally stupid suggestion: a "Complete" tag or checkmark or something would be very satisfying to mark mods that you have completed. I don't think there's currently an easy way to determine that from outside of the game engine, if at all. I meant one the player could check, themselves. When filtering gets added that and unplayed should definitely be options. It works fine, but on my end sometimes it takes ages to register my inputs. 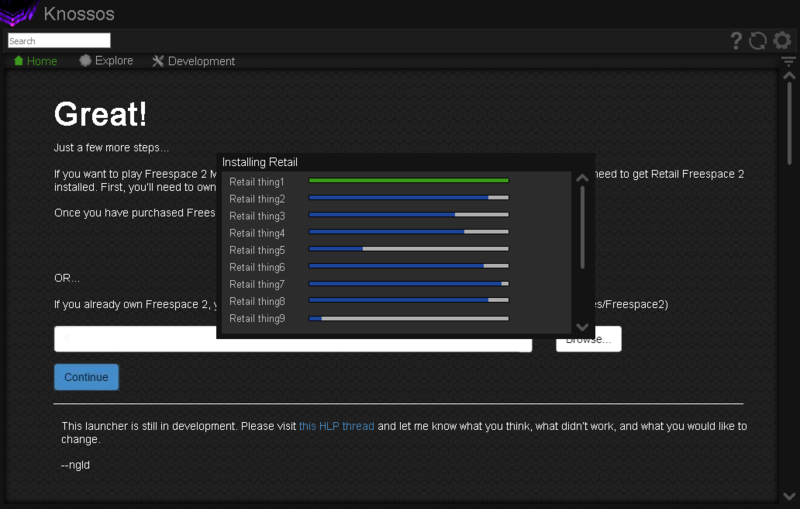 For example I will click on "Install". And only 5 minutes after it actually starts installing. Not sure what's the cause of it. Other than that, it got me back into Freespace Currently playing the Ancient-Shivan war campaign ! Meet the Rollcage community ! It might be possible with the Extension system (which hasn't been implemented yet), but it would be preferable for there to be a newer MediaVPs release incorporating all of them instead.